People don’t know much about the Land Rover range. With the exception of the Defender and perhaps the Discovery, vehicles such as the Discovery Sport don’t exactly ring a bell as to where they lie within the line-up. As the brand’s “leisure” model, it replaces the Freelander which was discontinued in 2014. With the likes of the Audi Q5, Mercedes-Benz GLC, and Porsche Macan within its price range, can the Discovery Sport carve up its own niche in the crowded segment? Packaging is the Discovery Sport’s single biggest advantage. Based off its cousin, the Range Rover Evoque, the Discovery Sport is stretched by 80 millimeters and has a unique suspension design that allows it to accommodate a total of 7 seats. This alone offers it a leg up against the competition. Although the third row is still best left for emergencies, slide the second row all the way back and you end up with one of the biggest leg rooms in its class. Furthermore, cargo space ranges between 480 to 689 liters. Practicality aside, the interior itself is smart, airy, and not as ostentatious as some of its rivals. The materials used throughout are plush with nicely damped switchgear and brushed aluminum trim. The resulting driving position isn’t as low or sporty as its competition, but it’s comfy nonetheless. The broad seats are firm and supportive, and for the driver, getting the right seating position is easy thanks to the 10-way power adjustment. The controls, especially for the climate control are clearly marked and easy to use as well. If there’s one thing that needs improvement, it’s the infotainment system. Not only does it look dated, but it’s also laggy and convoluted to use. Finding a radio station or inputting a destination in the GPS requires careful fiddling and sometimes, hitting the appropriate icons can be tricky due to their small size. Also, there’s no Apple CarPlay or Android Auto. On a positive note, at least the 10-speaker sound system sounds nice. Outside, the Discovery Sport smoothens out the traditionally upright, boxy profile of Land Rovers. Yet, the roofline is still formal and pulls over the rear arches more so than the others which are so coupe-obsessed. The wheels, even at just 18 inches in diameter do the job of filling out the wells while its connection to the rest of the “Rover” family is announced by the thin honey comb grille and clamshell hood. Fitted with Jaguar-Land Rover’s new 2.0-liter turbodiesel engine, the Discovery Sport makes 150 horsepower and 380 Nm of torque. This Ingenium engine is respectably smooth, although some diesel clatter does come out at higher rpms. Off the line, it struggles to pull this steel frame/aluminum bodied SUV. The 9-speed automatic, with its ultra-low first gear does mitigate this weakness somewhat. That said, once it gets to speed, it’s an amiable performer with good grunt. While it lacks straight line oomph, the chassis it’s bolted is another one of the Discovery Sport’s greatest assets. Ride quality is excellent, with none of the contrived sportiness. Though it can get a touch bumpy around town, it sorts itself quite nicely when dealing with larger potholes or cruising on the expressway. The upright, boxy body does whip up a bit more wind noise at speed, but road and tire noise are kept at bay. Designed more as a leisure vehicle than an all-out canyon carver, the Discovery Sport finds itself tipping and leaning during hard cornering. Still, it serves up plenty of grip and combine that with a nicely-weighted and precise steering, and it results in a confidence-inspiring machine. Though there was no chance to take it off-road, the full-time all-wheel drive with a Haldex center coupling and Terrain Management System should mean it’ll be better than just about anything else off road. Plus, 600 millimeters of water wading depth is nothing to sneeze at. 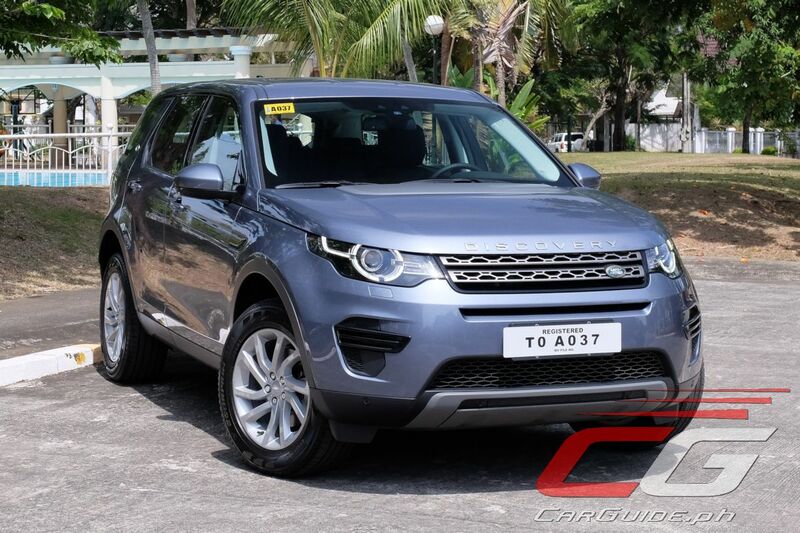 Priced at P 4,390,000, the Discovery Sport easily undercuts the likes of the Audi Q5 and Lexus RX 350 F Sport, and matches the recently launched BMW X3. It stands at par with all of its competitors in terms of luxury and convenience features, but this one has the edge when it comes to safety. It’s the only one among the SUVs mentioned to offer Lane Departure Warning and Automatic Emergency Braking as standard. As the point of entry into the world of Land Rover, the Discovery Sport comes off as a comfortable, capable, and surprisingly practical premium SUV. Just as Land Rover tapped an entirely new market with the Evoque, the Discovery Sport continues to offer that same handling finesse, style, and capability in a more family-friendly shape. Looks like the Fortuner, but the Fortuner honestly looks better inside and out. Not to mention that it is far more cheaper. dyos ko. ang layo naman sa fortuner nito. The Discovery Sport is also way smaller. It's a compact SUV (RAV4/CX-5/CR-V/Tucson), a size class below the midsize Fortuner. Dont mind the opinion of a poor and uneducated man. They usually talk non-sense. Like or not the fact is the interior design of the Discovery Sport is a decade behind mainstream rivals and it's priced over twice as much as it should be. FYI, non-sense is spelled as nonsense. Thanks for putting people down, sire. Good evening! May I asks about the reliablity of this car brand? Is it reliable or not? Thank you for the answer. This is Land Rover. The name already speaks for itself. Same question here I'm reading comments and car reviews about this car brand but it seems that they are not satisfied with its reliability. Can you give the answer?